While Lorelai and Rory’s unique mother-daughter bond is one of our favorite relationships from the show’s seven-season run, the series was filled with every kind of relationship—friends, boyfriends, parents—and taught us so much about what it means to be in one. October 19, 2015: The day it was announced Gilmore Girls is getting a four-episode revival on Netflix, and millennial women (and their moms) across the internet started dancing like Sookie. Though the rumored quartet of 90-minute episodes isn't officially confirmed just yet, it's basically a done deal, and cast negotiations have already started to get Lauren Graham and Alexis Bledel back on board. 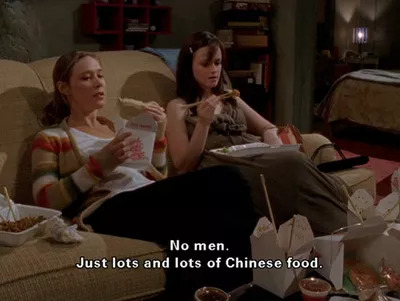 And while Lorelai and Rory's unique mother-daughter bond is one of our favorite relationships from the show's seven-season run, the series was filled with every kind of relationship—friends, boyfriends, parents—and taught us so much about what it means to be in one. Rory's first real relationship was a major adjustment—for her, and for Lorelai. Young viewers of the show watched and learned as Rory navigated the waters of having her first boyfriend— who could forget the first awkward kiss (plus a little light shoplifting), the first homecoming dance, the first breakup? At first, Dean seemed like the perfect boyfriend—he loved Rory fiercely, got along great with Lorelai—I mean, he built Rory a freakin' car! But even those on #TeamDean can't deny the ridiculous chemistry when Jess came along. Which meant a torturous breakup with Dean, even more conflict between Rory and Lorelai and added heartbreak, especially when Jess left for California. But in the end, Rory and Jess learned so much from each other, and they clearly wouldn't be where they are now without that relationship. Everyone knows that Luke and Lorelai were the only possible endgame (except maybe for Lorelai by herself, because girlpower, amirite?). Theirs was an epic, will-they-won't-they relationship, with Luke mostly waiting on the sidelines as Lorelai dated other guys who were clearly wrong for her (ahem, Digger Stiles). But Luke+Lorelai perfectly complimented each other, with his surliness and her sarcasm. Even if you have to date some frogs, you'll eventually find your prince. 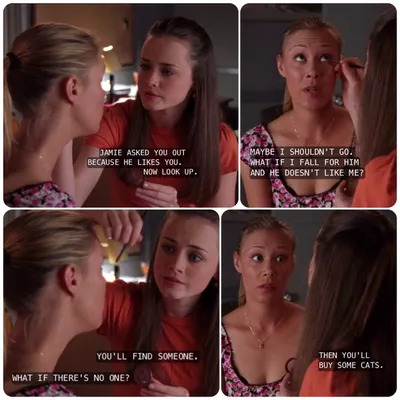 Paris and Rory started as fierce enemies (mostly on Paris' end), but they grew out of petty fights over guys, and became an awesome, feminist friendship (and there's even fandoms out there who eschew #TeamDean or #TeamJess for #TeamParis...). Emily and Lorelai were, of course, essentially estranged at the start of the show. Still, Emily always worked to give Lorelai the very best, and even if the way she did it was misguided, her heart was there. Meanwhile, Lorelai, who had spent so long trying to build up an independent life of her own, had to learn when to accept help from her mom. Both showed us that mother-daughter relationships can be tricky and complex, but where would you really be without your mom?